This was a seven day cruise from Cape Liberty, New Jersey. It combined an overnight stay in Bermuda and a call in Boston, Massachusetts. An unusual itinerary but one that combined two vacation experiences - - a tropical beach break and one that offered history and culture. This was my fifth cruise on Anthem of the Seas. I like the ship's sophisticated décor and the variety of dining and entertainment options that Anthem offers. In my view, the ship is operating at its most efficient level since entering service. Moreover, Anthem still holds a great deal of promise for the future. As I watched Anthem's North Star observation capsule rise into the sunny sky above Bermuda's Dockyards, I thought Anthem has certainly come through a lot to get here. It struck me as a symbol of the ship's triumph over adversity. One of the original reasons for building the Quantum class cruise ships was the desire to have a state of the art cruise ship to serve the greater New York market. Accordingly, the first ship in the class, Quantum of the Seas, was designated to be Royal Caribbean's NY/NJ ship. However, late in the process of building the ship, it was determined that the channel surrounding Bermuda would not be ready to accommodate a ship of this size in time for the summer 2015 season. Since sailing to Bermuda in the summer is key to serving the relevant market, a slightly smaller ship (Liberty of the Seas) was assigned to cover the summer 2015 season. So after wintering at Cape Liberty, Quantum sailed off into the sunrise to serve the growing Chinese market. Royal Caribbean, however, did not give up on the idea of having a Quantum class ship sailing out of Cape Liberty. The second ship in the class, Anthem of the Seas, had been envisioned as serving the British market out of Southampton. But with the re-deployment of Quantum to Asia, Anthem was re-assigned to fill the gap in New York. The thought was that by the start of the 2016 season, the channel in Bermuda would be ready and Anthem would be able to fulfill the role that originally drove the creation of the Quantum class. As a result, after entering service in the Spring of 2015, Anthem only sailed out of Southampton for a long summer. The problem with the channel in Bermuda, however, was not the only issue facing Anthem Relying on advanced technology, the Quantum class were built to be “smart ships.” However, when Quantum came to NY/NJ in late 2014, the new technology had some teething problems. Many of these problems were worked out during Quantum's brief season in the Northeast but some were left for Anthem. Having sailed five cruises on Anthem since she entered service, I have seen steady improvement in the technology. Now, the technology does what it is supposed to do and it is easy to make reservations, book shore excursions check your account etc. in addition, the ship has very good wi-fi. A second issue that had to be dealt with was the dining system. Instead of having a traditional cruise ship dining system centering upon one large main dining room, the Quantum class was designed around a new system called Dynamic Dining involving four main dining rooms plus a number of specialty restaurants and alternative venues. The idea was that each of the four dining rooms would have a different style thus giving guests more choices. In addition, since guests would not be assigned a time to dine, they would be able to decide for themselves when and where they wanted to eat. To Royal's surprise, some guests had a very vocal and hostile reaction to Dynamic Dining. Particularly people who had cruised with Royal before, said that they preferred the traditional system where you dine with the same people and are looked after by the same staff members each night. Combined with Quantum's technological problems, these criticisms gave Dynamic Dining a bad reputation. Royal went back to the drawing board and designed a new system for Anthem in which guests could select either Dynamic Dining or a modified version of the traditional system called Classic Dining, In the latter system, the guests dine at the same time each night with the same tablemates and waiters. However, like the Disney ships, the guests and the staff rotate through the four main dining rooms during the course of the cruise. The dining systems on Anthem are now working very well. People who like the traditional system seem happy with Classic Dining. In addition, people who like a more flexible approach to dining enjoy the Dynamic Dining system. At the same time, the flavor, quality and variety of the food in the main dining rooms has reached a new level. Perhaps this is a competitive reaction to the improvement in the menus on the Norwegian Cruise Line ships. Perhaps it is a product of increased staff enthusiasm for a system that is now working efficiently. In any event, it is all to the benefit of the guests. When Quantum debuted each of the restaurants had one menu throughout the cruise. This led to complaints about a lack of variety. When Anthem entered service, each of the four main restaurants had one menu for the beginning of the cruise and another for the last part of the cruise. I am told that shortly Anthem will be going to three menus in each of the main dining rooms. With all the focus on the main dining rooms, people tend to lose sight of the fact that Anthem has some very good specialty restaurants. The Chops Grill steakhouse has excellent beef and I was impressed by the service. Jamie's Italian is also very good. The ship began service with another specialty venue called Devinly Decadence, which specialized in healthy alternatives. Unfortunately, this venue did not attract a large number of guests and so was replaced by the Solarium Bistro. During the day, this venue serves the same items as the ship's main buffet restaurant. During the evenings, however, it offers complimentary dinners featuring a variety of Mediterranean style items. A nice concept but still, this venue is struggling to find its audience. Another issue Anthem has had to contend with was one of perception. Anthem is a significantly different ship than other Royal Caribbean ships. 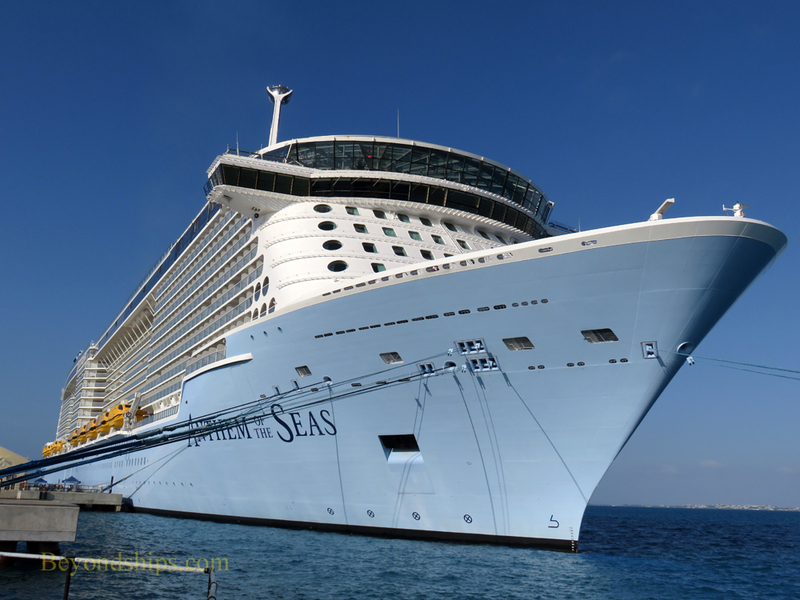 While there are certain themes and elements that run through the Royal Caribbean fleet, the cruise experience on a Radiance class ship is much different than the cruise experience on a Freedom class ship or an Oasis class ship. In the publicity leading up to the premier of Quantum, Royal tended to emphasize things like the bumper cars and the sky diving simulator. Naturally, this led many people to assume that Quantum was a vast amusement park along the lines of the Voyage and Freedom class ships. This caused some disappointment when these people came aboard and found that Quantum was actually a sophisticated ship more akin to the ships of sister brand Celebrity Cruises than the rest of the Royal Caribbean fleet. The amusement park is a very small part of the ship. Over time, people have become more aware of the difference. You still hear some guests say that they preferred Explorer of the Seas or Independence of the Seas. However, most say that they like Anthem as well. After all, it is not a competition. Everyone has a favorite food but that does not mean that you cannot enjoy other dishes. The weather over the 2015-16 winter posed yet another challenge. As widely-reported Anthem was caught in a storm that was much worse than predicted and was forced to return to Cape Liberty. Some in the media tried to paint this incident as carelessness. However, I had been on Anthem just before this incident and the captain had taken such care to avoid a severe winter storm that we were a day late in returning to port. In addition, I have spoken to officers on some of Royal's competitors and they all agreed that the incident reported in the media was not Royal Caribbean's fault. Furthermore, while the guests may have been uncomfortable, there were no significant injuries and no major damage to the ship. Turning to entertainment, guests on Anthem have a variety of entertainment choices. Most are offered several times during the cruise at various times, which gives you more flexibility in scheduling. The main show in the theater is We Will Rock You, a West End musical based on the music of Queen. The show is well done. However, as on all ships that present a full musical, the issue is how many times can you see it. For some reason, it is easier to enjoy a revue multiple times than it is to sit through a show with a plot even if you liked it the first time you see. Since Anthem already attracts a significant number of repeat guests, this is a growing issue. The second show in the theater is The Gift, a show developed for Royal Caribbean. Again, the production cast performs well but the show, set in Victorian England, is hard to follow and depressing. In addition to the production shows, the theater is used for shows by visiting comedians and singers. On this voyage, the performers were average cruise ship performers - - entertaining but not particularly memorable. Anthem's second entertainment venue is the technologically sophisticated 270 lounge in the after part of the ship. A spectacular room, equipped with screens, projectors, moveable risers and equipment for aerial performers, 270 is an interesting place to be. Its main show remains Spectra's Cabaret, a surreal fantasy that showcases the room's technology. Many guests are baffled trying to figure out what is going on. However, I have come to the conclusion that there is no plot and that it is best to just let your senses enjoy the experiences on a non-intellectual level. In that mode, I have enjoyed seeing the show several times now. A third entertainment venue is the Music Hall, a two story nightclub with a large dance floor. It is used for theme parties and other activities but the main entertainment is provided by tribute bands. Naturally, how much you like such a band is correlated to how much you like the band that they are imitating. For me, the Beatles tribute and the Led Zeppelin tribute (Quantum) were the most enjoyable. On this cruise, the band played Aerosmith who I remember seeing when they were unknowns many centuries ago. In any event, this tribute band was good. A standard feature on all Royal Caribbean ships is a piano player in the Schooner Bar. Mat Ye, who performed on this cruise, was anything but standard. Funny and personable, this showman attracted a standing room only audience each evening. Speaking with Hotel Director Ron Ness, I expressed my satisfaction with the current state of Anthem. However, showing the enthusiasm that seems pervasive among the officers and crew, he indicated that Anthem is bound for even greater heights in the not too distance future.